Does your springer spaniel bark excessively? 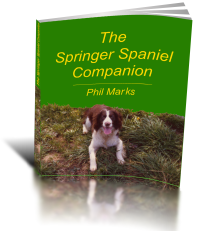 Springer spaniels are not noted for barking excessively like some small pooches do, though they can get excited at times. You do need them to bark when there’s a stranger outside your home, or with pleasure when the kids come home from school, and of course, when nature calls! But annoying the neighbours? No, you don’t want that. The good news is that there are answers to the problem, depending on what the reason for the springer spaniel barking is. Knowing why might lead you to the best solution. Do remember, though, that dogs bark as we talk. I bet that even you talk to yourself when you are sometimes alone! I do, anyway (maybe I’m crazy). Maybe you need the advice of a renowned a professional dog trainer such as Dr Denis Fetko (‘Dr Dog’), so that you can save yourself a load of hassle, and best of all, cure your springer at an affordable cost. The key thing is that you want them to bark under certain conditions only, and you want them to be quiet when you tell them. You don’t want to stop them barking completely. 1. Your dog is checked regularly when you groom her (or him). 2. That he/she gets checked annually by the vet. 3. That the dog’s normal living space is at the right temperature. 4. That he gets enough exercise. 5. That in fact you do not have lots of strangers calling at the door, and that there are not a lot of foxes or raccoons in your garden at night (get the idea)? Does your springer only causes a problem when he’s alone and you are in work, and the neighbours complain about it? If she is not not messing in the house then the reason could be loneliness. Try leaving a radio playing. Dogs do suffer from poor hearing (especially older ones) even deafness on occasion, and it’s essential to check regularly that your springer’s ears are clean. He might not be able to hear you telling him to stop barking. If your dog was ok before, but is now a problem, then that is a sign that something has changed – it could be his age or health, it could be that your daughter (he’s been her favourite) now has her boyfriend visit and he’s jealous. Have you changed his food? Moved home? Bought him a new dog basket? In short, does he have anything to complain about – because they are smart dogs and they complain if they are not happy. One of my springers didn’t bark when he was unhappy or I scolded him – he grunted like an old man. OK, so you’ve worked through all the obvious things. Maybe your springer spaniel is now 8 months old and the barking problem continues. Training is going well, he is now obeying the basic commands and walking to heel, you have started the ‘fetch’ training, yet the excessive barking persists. Maybe you’ve got a rescue dog and not a pup. He might have had a tough life so far, you don’t always know. Did you ask the staff at the rescue centre if he barked excessively? It’s not always a sure guide, as there’s often a lot of barking at these centres anyway – the staff have no control over which dogs arrive at their gates. There are plenty of solutions to the barking problem (depending on the reason), but first of all, don’t reinforce the behaviour. If the dog barks, then don’t give her a cuddle – it doesn’t work with kids and will not work with her. Some people favour electric collars – that’s an old approach and not in keeping with best practice. The key to curing is understanding, and if you’ve looked at the problem from all angles without success, then you probably need professional advice. Dr Denis Fetko is a leading dog behaviour expert, and can help you stop your springer’s excessive barking. His expertise is readily available, affordable and very popular, not only for springer spaniel barking problems. Check him out at Dr Dog!